Early Spanish explorers to the New World called hummingbirds joyas voladores or “flying jewels.” They had never before seen the tiny, brightly colored birds with long needle-like beaks, because hummingbirds only live in the Western Hemisphere. Horticulturists theorize that this is why the birds seem to prefer flowering plants native to this half of the world. Vividly colored and aeronautically amazing, hummingbirds attract us to gardening as much as we attract them to our gardens by creating welcoming habitat. What does it take to lure these visitors to Southern California backyards, and how long will they stay at your open-air B-n-B? But before we even go there, which members of their family can you expect? While gardeners in cold winter areas must say goodbye to hummingbirds in fall as they migrate south, some hummingbirds live in Southern California year round. The Theodore Payne Foundation for Wild Flowers and Native Plants in the Los Angeles neighborhood of Sun Valley notes six kinds of hummingbirds that are common here. The Foundation reports that Calliope, Costa’s, and Rufous hummingbirds are seasonal occupants whereas Allen’s, Anna’s, and Black-chinned hummingbirds generally stay year round. The Foundation’s website provides links to descriptions of each species, which aid in identifying which ones are in your backyard. 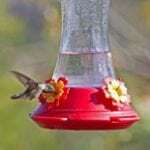 Other kinds of hummingbirds may make surprise visits, according to the San Diego County Bird Atlas. These include the Broad-billed, Magnificent, Violet-Crowned, and Xanthus hummingbirds as well as a Rufous/Allen’s hybrid. But of the more than 300 species of hummingbirds from Alaska to the tip of South America, only 19 species migrate through North America. Hummingbirds that overwinter in southern parts of the U.S. don’t necessarily live in those areas year round. Nesting areas generally are different from winter homes. Scientists theorize that the long beaks and tongues of hummingbirds co-evolved with tubular shaped flowers. As hummingbirds gather nectar, they accidentally collect pollen on their beaks, heads, and feathers. Pollination occurs as the birds travel from one blossom to another. One of the strongest arguments for the native plant movement is that native birds and insects are drawn to the flora that has fed them for millennia. The relationship is symbiotic. 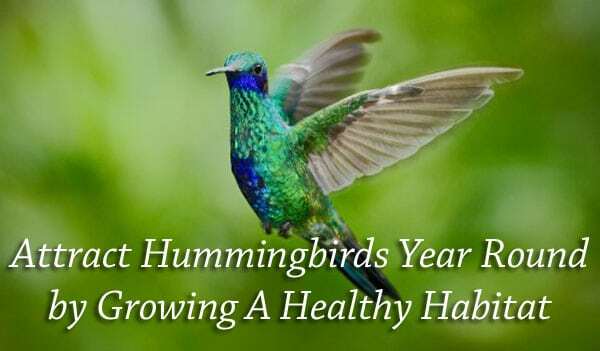 Yet this isn’t to say that hummingbirds won’t drink the nectar of plants from other parts of the nation or the world. For example, hummingbird plant lists include hot poker plants (Kniphofia spp. are native to Africa) as well as foxgloves (Europe) and hollyhocks (Europe and Asia). Some plants that don’t at first appear to have tubular flowers, such as zinnias (a Southwest native), are hummingbird favorites. Zinnias have a “composite” structure of flat petals surrounding clusters of tiny tubular blossoms. Along with close relatives, such as asters and sunflowers, zinnias are drought and heat tolerant. This leads to another important point about regional native species — they are adjusted to regional growing conditions. Finally, you’ve probably heard that hummingbirds adore red. Unlike bees, which are attracted to the fragrance of flowers, hummingbirds have a weak sense of smell. However, hummers have excellent vision, especially for red and any colors in its range, such as oranges, pinks, and many shades of purple including lavenders and blues. In contrast, bees hardly see red flowers unless they have ultra-violet markings called “bee lines.” If you’re wondering about butterflies, they have strong color vision and see a broad range of colors. However, unlike hummingbirds which can hover while feeding, butterflies can’t sip from many tubular flowers on which there is no place to stand. Hummingbirds also have strong recall of gardens where they previously found good meals of nectar and tiny insects (they need protein) and will return year after year, especially if you keep adding plants they love, provide supplemental nectar in feeders, and avoid chemicals that kill beneficial insects. It’s important to note that pesticides and herbicides may weaken hummingbirds. Good hummingbird habitat also includes water sources — such as bird baths with misters or solar-powered drip fountains — and trees and shrubs for rest and nesting. Feed them and they will come. Green Thumb Garden Centers offer many plants appropriate for hummingbird gardens. Please remember that we encompass five garden centers and not all choices may be available at each one at the same time. However, we’ll always do our best to help you select alternate choices if necessary and to locate useful equipment like nectar feeders, shepherd’s hooks for hanging feeders, birdbaths, and other water equipment. Here are some tasty shrubs and perennials to find at Green Thumb, most of which are California or American native species. All the links connect you to the suggested hummingbird plant list of Orange County’s Santa Margarita Water District except for a Sacramento Bee article about coral fountain plant. Here are some helpful plant lists from other sources. Even if they plant lots of nectar flowers, many gardeners also hang feeders. The nectar mixture for these bowls and bottles (vertical or horizontal) should contain only water and white sugar. In an article about creating “a hummingbird friendly yard,” Audubon stresses never to use honey, artificial sweetener, or red coloring, all of which may harm hummingbirds. The standard nectar recipe combines four parts hot water (boil for one to two minutes) with one cup of sugar. Stir until the sugar dissolves, then cool the mixture in the refrigerator before filling feeders. Change the nectar about twice a week, but first clean the feeder with hot water to remove any sticky residue and debris. Although you should never use soap or other cleansers, Audubon says a solution of four parts water to one part white vinegar is okay. Happy hummingbird gardening to you! For any questions about plants, gardening techniques, or equipment for wildlife gardening, please contact us at Green Thumb.